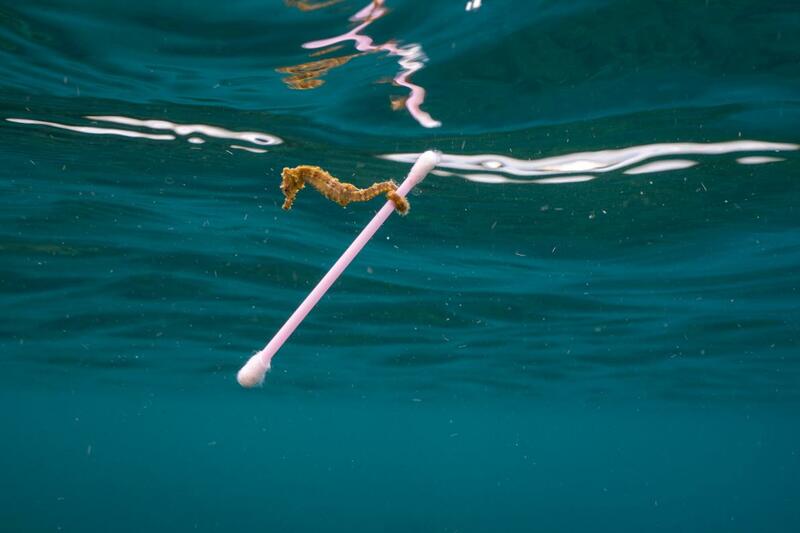 For some, it was watching David Attenborough’s Blue Planet II, and for others it was seeing Justin Hofman’s picture of a seahorse clutching a cotton bud that made them realise that the ubiquitous use of single-use plastics has become unsustainable and is something that needs to be changed. There have been some large-scale attempts from governments to reduce plastic use, such as charging for plastic bags, the controversial proposed plastic straws ban, and the incentivising discounts in coffee shops for those who bring reusable cups. However, there are also many small and easy things one person can do to reduce their waste and help the environment. A lot of fresh fruit and vegetables in supermarkets are packaged in unnecessary plastic, something the Instagram account @pointless_packaging aims to highlight, and so an easy way to get around this is to try and buy them loose instead. This is possible in most supermarkets, as well as in Roots Fruits & Flowers on Great Western Road. Make sure to avoid using the small plastic bags offered to put loose, small items in, such as mushrooms or tomatoes. Instead, use brown bags as they can be recycled or composted. You could also buy reusable produce bags, which are light and easily washable. Similarly, shopping seasonally and buying British fruit and vegetables when you are able to can help to reduce air miles and, more often than not, taste fresher than imported ones. If you’re getting some takeaway food, whether it be soup from Food Factory or a pasta salad from Tesco’s, bring your own cutlery. Throwing a knife, fork, and spoon into your bag (or even a spork if you’re prepared) takes about two seconds but could mean the difference between you having to use single use plastic cutlery unnecessarily. I try and keep my spork in my bag all the time; you never know when you might need it! Try removing your makeup with a reusable microfibre cloth, which needs just water to take off even waterproof mascara and is machine washable. You can easily get one from Liquorice Tree Gifts on Great Western Road. Sanitary products are expensive and extremely bad for the environment, but are necessary for people who menstruate. Consider trying to use a menstrual cup instead. Or, if that’s too uncomfortable, there are reusable pads or period pants. However, if you can’t give up disposable sanitary options, perhaps look into buying organic and plastic free options; Natracare is one option and can be found in Waitrose on Byres Road and Napiers on Cresswell Street. Another option is Totm , which can be found in Tesco’s. And don’t forget, free sanitary products can be found in a number of bathrooms across campus, including QMU. A large proportion of toilet paper is made from virgin paper (i.e fresh trees), rather than recycled paper, which is really unnecessary. Furthermore, when you buy rolls from the supermarket, they’re also covered in plastic which will end up in landfill. This is where Australian company Who Gives A Crap comes in; their recycled toilet is made from ‘100% post-consumer waste paper’, and it comes individually wrapped in colourful paper which can be recycled. What’s more, the company also donates 50% of their profits ‘to help build toilets and improve sanitation in the developing world’ and they also sell kitchen towel and tissues too! Next time you think about buying a new toothbrush, consider buying one made from bamboo rather than from plastic. You can get them fairly inexpensively from Amazon or locally at Roots, Fruits & Flowers. Have a go at using solid shampoo, conditioner, soap and deodorant, all of which can be bought plastic free (and they last a surprisingly long time!) I keep mine in a little box that I got from when I had a Chinese takeaway, and I take that to Lush so I don’t have any waste at all. Fast fashion is extremely unsustainable and very wasteful; it encourages consumers to constantly be buying new, trendy clothes and, when the clothes are no longer ‘in’, a lot of them get thrown into the landfill. Not to mention the large amounts of water it takes to make brand new clothes. Places like H&M allow you to drop off textiles (regardless of condition and brand) in their stores in exchange for a voucher, and this reduces textiles going to landfill. Shopping at second hand/vintage stores is a good way to combat fast fashion as there’s no extra waste and you’re feeding into a circular economy rather than a linear one. There are lots of places in the West End to buy vintage clothes, for example Glorious and The Glasgow Vintage Co., both on Great Western Road. Some great charity shops include Shelter (both by the Botanics and by Kelvinbridge), as well as others along Great Western Road, Byres Road, and Dumbarton Road. Don’t just limit yourself to buying clothes second hand, Oxfam on Byres Road is incredible for second hand books, and Emmaus on Dumbarton Road and Great Western Road has a huge variety. For more on charity shops, check this article out. Giving gifts can be difficult as foil or glittery wrapping paper cannot be recycled. Instead, maybe wrap presents in newspaper or buy a second-hand scarf and use that to wrap the present (either as part of the gift itself or as something to take back, I find people are often more than understanding about that). Equally, just don’t wrap it up at all; some people are more concerned with the present itself than how/in what it’s wrapped! Whilst this is just a list of small things you as an individual can do, it must be acknowledged that large corporations are the biggest source of waste. If you can, put pressure on companies to reduce their waste through signing petitions and let them know you are unhappy with their levels of waste. Moreover, this is not a definitive list, nor am I saying that everyone should be doing everything on this list as I know that shopping in places such as Roots, Fruits & Flowers, and Waitrose can be expensive and, if you don’t live nearby, unfeasible to shop at. My final advice would be to just be aware about your waste. Maybe track how much of your waste cannot be recycled or reused in one week. Every time you throw something away, think about if there could be a plastic free alternative to the product. Look at websites such as Zero Waste Scotland and Zero Waste Home, or watch Youtubers such as Sustainably Vegan and Trash is for Tossers. Just remember: one bit of plastic that you use every day is a lot better than using single use plastic, and anything you can do to reduce your waste is amazing.